Please click one of the areas below to read more about it. AUXAIR participates in many Coast Guard missions including Search and Rescue, Port Over Flights, Waterways and Coastal Security, Marine Safety, Pollution Response, and Aids to Navigation. It also conducts Logistic Transport Missions. AUXAIR is an integral part of the Coast Guard search and rescue team and its homeland security forces. As with surface operators, air facility operators are issued patrol orders. Orders are issued based on the needs of the Coast Guard and the availability of crews and facilities. Coast Guard Air Stations are the Order Issuing Authority for AUXAIR. This alignment of Auxiliary aviation assets in a district with an Air Station is known as the “squadron concept”, because aviation orders and direction flow directly between the Air Station and the district aviation staff. Auxiliarists involved in AUXAIR take Auxiliary aviation training, completing the syllabus for their level of qualification. 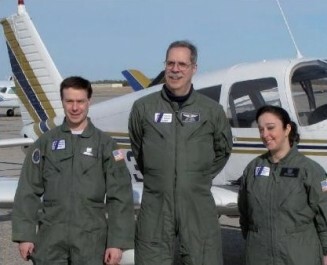 After having their knowledge and skills approved by an Auxiliary Flight Examiner, they may be certified by the District Director of Auxiliary (DIRAUX) as Pilots, Observers or Air Crew in the AUXAIR Program. Q: Why Join US Coast Guard Auxiliary Aviation? A: AUXAIR offers several very worthwhile ways to be part of a valuable team. One can serve as Observer, Air Crew, Copilot, First Pilot or Aircraft Commander and participate in a number of mission areas including: Logistics, Aids to Navigation, Marine Safety and Pollution, Port Over Flights, Waterways and Coastal Security, and Search and Rescue. Q: So how do I get started in Auxiliary Aviation? A: First one joins the Coast Guard Auxiliary and becomes a "Basically Qualified" (BQ) member. This involves getting some education about the Auxiliary, its structure and organization. As the Auxiliary predominantly deals with boating safety, some background knowledge about boating is a necessity. New Auxiliarists therefore take an Auxiliary boating safety course, another qualified course or self-study, and then pass an examination. Once Basically Qualified, they may undertake study in any of several Auxiliary programs including Auxiliary aviation (AUXAIR). Members involved in AUXAIR must earn their qualifications through advanced training. This training is designed to develop observers and pilots for Auxiliary service. Q: I’m just a private pilot. Can I be an Auxiliary pilot? A: Of Course!! Persons who hold FAA Pilot Certificates may participate in AUXAIR either as Auxiliary pilots (depending on certificates and experience) or as Observers. The Auxiliary does not offer flight training; rather, it builds on what certificated pilots already have learned. Pilot applicants learn about search and rescue (SAR) techniques and patterns, Coast Guard communications, and Coast Guard flight safety rules and procedures. Pilot candidates must successfully pass a written open book test and take water survival training, as well as pass a SAR procedures check ride. Pilots with 200 hours or more logged as Pilot in Command (PIC) may be eligible for Auxiliary aviator designation as Copilot. Pilots with 500 or more hours as PIC may become First Pilots, and aviators with at least 1000 hours PIC and an Instrument Rating may be designated as Aircraft Commanders. Pilots with fewer than 200 hours PIC may become Observers or qualify as Air Crew. Auxiliary flight crews have an important job to do and are held to high standards of training and safety. Q: I&apos;m not a pilot. Can I help Auxiliary Aviation? A: Non-Pilots may participate in AUXAIR as Observers or Air Crew. Observers are generally assigned to handle the communications between the aircraft and Coast Guard units, keep records in the air, and are the active searchers on SAR and other missions. Observers receive aviation orientation and training in observation techniques, communications, search techniques and patterns, and safety and survival skills. Observer candidates must successfully pass a written open book test and take water survival training. Experienced Observers and pilots with less than 200 hours PIC may be eligible to earn the Air Crew rating. The training for this rating rounds out the Observer&apos;s knowledge with more instruction on aviation and aircraft operations, Crew Resource Management, aviation communications and navigation procedures. The water survival training required of all Auxiliary aviators and Observers includes a 75 yard swim (with PFD on), training in life raft usage and emergency aircraft egress. Q: Can I use my plane in Auxiliary Aviation? A: Pilots may offer their airplanes for use as Coast Guard Auxiliary operational facilities. Planes are inspected to verify that they meet requirements and that all paperwork is in order. A marine radio must be available for use in the plane and an external antenna must be installed. All aircraft used in AUXAIR operations must be approved facilities. The Coast Guard does not make any assurances that aircraft will be accepted as operational facilities nor does it suggest that all qualified Auxiliary members will be accepted into the aviation program as pilots. Fiscal, operational and geographical needs of the U.S. Coast Guard are the controlling factors in the AUXAIR program. Auxiliarists using their own aircraft on ordered missions may be reimbursed for fuel and maintenance expenses. They are also covered by Federal insurance and liability protection in the performance of their official Auxiliary duties. 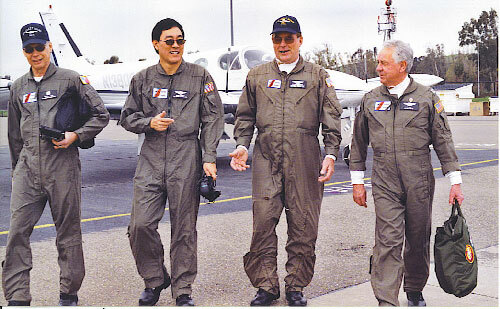 Qualified Auxiliary pilots, assigned to duty, are considered to be Coast Guard pilots, as are Auxiliary aircraft deemed to be Coast Guard aircraft when on assigned duty. As the missions and responsibilities of the Coast Guard have expanded, so has the need for Coast Guard health care personnel to not only perform their usual clinical activities, but to also be available for emergency mobilization and/or deployment. 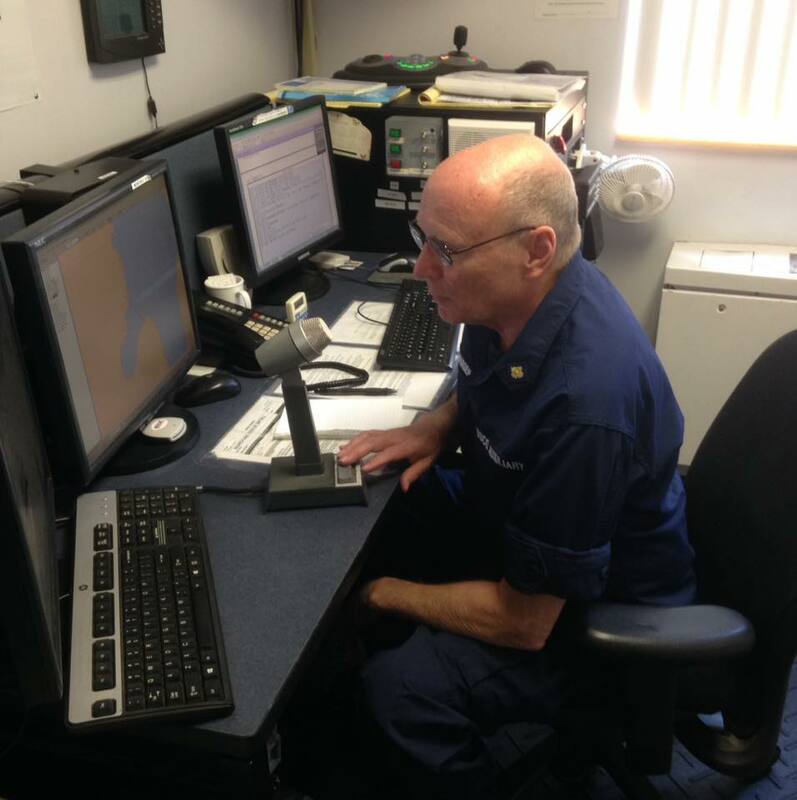 During surge operations, Auxiliarist participation may further augment the health care capabilities of existing Coast Guard clinics and potentially release active duty health care personnel for operational response or deployment. Therefore, in accordance with Coast Guard Auxiliarist Support to Coast Guard Health Care Facilities, COMDTINST 6010.2 (series), Auxiliarists who are health care professionals (i.e., Physicians (MD, DO), Dentists (DDS, DMD), Physician Assistants (PA), and Nurse Practitioners (NP)) are authorized to be utilized in the performance of Coast Guard health care activities for which they are already trained, found qualified, and licensed, registered, or certified as determined by the Director of Health and Safety (CG-11). These primary care medical and dental professionals are eligible to volunteer in Coast Guard clinics or sickbays where the Coast Guard is already providing a similar level of health care and within established guidelines and restrictions. Auxiliarists who possess other allied health care skills (e.g., Registered Nurses (RN), emergency medical services providers like EMTs, Paramedics, and First Responders) may volunteer to work in Coast Guard health care facilities in accordance with provisions of the Coast Guard Medical Manual. Qualified Auxiliarists are authorized assignment to duty to support and augment food service programs at Coast Guard units. Auxiliarists who perform such duties at Coast Guard units or special events shall complete the AUXFS training program to qualify and demonstrate proficiency in Coast Guard food service procedures and practices. Under the general direction and supervision of the unit Food Services Officer (FSO) and the unit Executive Officer/Executive Petty Officer (XO/XPO), and with guidance from the senior AUXFS, a qualified AUXFS may plan meals and shopping lists (AUXFS may not perform any direct purchasing with any form or type of unit funds). An AUXFS may also prepare, serve, and clean-up meals. The Auxiliary Clergy Support program supplements and supports Navy Chaplains serving with the Coast Guard by expanding Religious Ministry within the Coast Guard to better meet the needs of Coast Guard members and their families. Coast Guard Chaplains (officers of the U.S. Navy Chaplain Corps assigned to the Coast Guard) provide Religious Ministry to Coast Guard members. They play a vital role in support of overall mission execution of the Coast Guard. Due to the limited number of Coast Guard Chaplains, they may be prevented or delayed in the timely response to Religious Ministry requirements. The Coast Guard (CG) recognizes that the CG Auxiliary is composed of many skilled volunteers, some of whom have clergy credentials. The Auxiliary Clergy Support Program expands the Religious Ministry capacity within the Coast Guard to better meet the needs of Coast Guard members. Auxiliarists with clergy credentials must meet many of the same qualifications as members of the Navy Chaplain Corps, which are described in COMDINST 1730.5. The Chaplain of the Coast Guard (CG-00A) administers the Clergy Support Program and its associated qualification and training requirements. The Auxiliary interpreter corps program is a component of the Auxiliary International Affairs Directorate. The Auxiliary Interpreter Corps was established in 1997 to provide interpreter support to Coast Guard operational, administrative, and public affairs missions. The Coast Guard Ombudsman Program is intended to improve communication between the Coast Guard command and the Coast Guard family members. Coast Guard ombudsmen are communication links, provide information and referral resources, and act as advocates for family members. It has been reported there are 767 United States Coast Guard commands, and that 269 of these units do not have a designated ombudsman. There are a variety of factors, not the least of which, is that many of these are very small units. It is perhaps the very nature of these smaller units that will ultimately provide the best opportunity for Auxiliary augmentation in ombudsman assignments. An ombudsman is appointed by the commanding officer. Command ombudsmen are volunteers and spouses of services members within the command, and may be filled by a Coast Guard Auxiliarist. Those Auxiliarists who wish to work more closely with the Active Duty Coast Guard members can qualify for Assistant and Examiner positions in Marine Safety and Environmental Protection. Auxiliary members will be required to complete a PQS (Personnel Qualification Standard) and have local base approval to participate in these Missions. Qualified Auxiliarists and their facilities are authorized assignment to duty to support and augment the Coast Guard’s navigation systems (NS) program. This includes verifying position and characteristics of private aids-to-navigation (PATON), after qualifying as an aid verifier (AV). Auxiliarists may assist and support aids-to-navigation (ATON) units in servicing Federal aids after eiving proper Coast Guard training. Auxiliarists may also help the National Oceanic and Atmospheric Administration (NOAA) and the U.S. Army Corps of Engineers (USACOE) in updating nautical and aeronautical charts and publications. Qualified Auxiliarists and their facilities are authorized assignment to duty to support and augment bridge surveys, investigate and provide information regarding waterways safety and navigation situations pertaining to the bridge program, and provide direct assistance and support to bridge program personnel. Do you know how to write HTML, CSS and PHP? Do you know CPanel? Did you ever want to learn how to make a website? Here is a way that you can help get our word out. Now a days almost everyone has a website. The Photo Corps, part of the Department of Public Affairs, consists of members who professional or advanced amateur photographers who take high resolution digital photographs for use within the Coast Guard and Coast Guard Auxiliary. Membership is open to any Auxiliarist who has the photographic equipment and skills to produce high quality images suitable for publication. Click the following link to learn more and download a two page PDF document on the Auxiliary Photo Corps. Every Flotilla, Division and District has their very own publication. Have you written articles this might be a way you can help the Auxiliary and others by what you write. The Coast Guard Auxiliary Public Affairs (PA) mission is to communicate to various audiences information concerning the United States Coast Guard (USCG) and the Coast Guard Auxiliary (CGAUX). By publicizing the missions and activities of the USCG and CGAUX, the public develops a better understanding and appreciation of our efforts and the positive impact of the same on our communities, states and the nation as a whole. One of the primary forms of communication to the public is by use of knowledgeable and motivated Auxiliary public speakers. The Auxiliary PA Speakers Bureau has the primary mission of assisting every Auxiliary District to develop, maintain and utilize a District Speakers Bureau comprised of trained and motivated Auxiliary members available to give public speeches when tasked. At this level, you should have experience in writing for the media, public appearances, static displays, digital photography, the National Safe Boating campaign and Coast Guard ranks and rates. These are the minimum skills expected of a flotilla public affairs officer. Requires a higher level of expertise. You are expected to demonstrate first-rate public relations skills and assist others in developing their skills. This level reflects the expected competencies of a district or division public affairs officer. At this advanced level you are qualified to assist a Coast Guard unit with their public affairs program. The competency includes knowledge of Coast Guard public affairs practices and procedures, internal communications, media and community relations, Joint Information Center (JIC) operation and related topics. 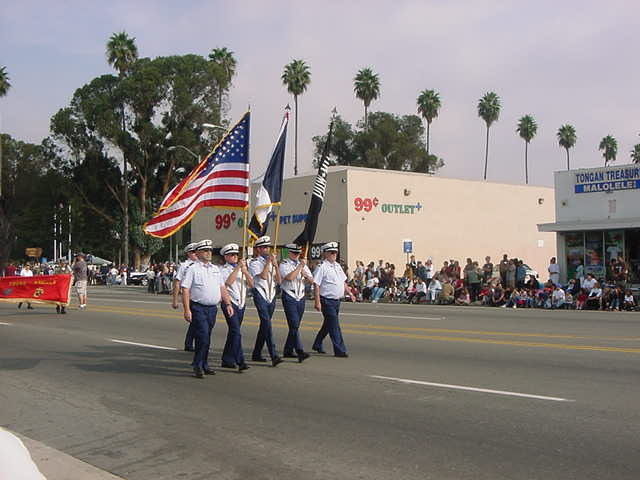 The United States Coast Guard Auxiliary is proud to provide Auxiliary Color Guards to present the "Colors" at various public and community events, such as during the playing of the National Anthem at public sporting events, dedications and other civic events and parades. We are also able to provide Auxiliary Honor Guards for Military Honors Funerals in some geographic regions. 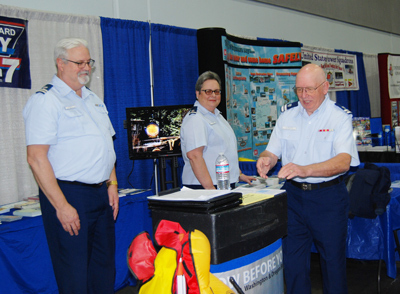 Below - Coast Guard Auxiliary Members at a boat show. Key to our dealer/partner outreach program are a cadre of trained Auxiliarists who visit you on a regular basis to drop off or restock boating safety literature displays, or to discuss upcoming special events with you. We call these members "Program Visitors", short for "Recreational Boating Safety Program Dealer/Partner Visitors", and they are our ambassadors to you. Whether or not you run a bait shop, an insurance agency, a marina, or a branch of one of the world’s largest marine chandleries, our Program Visitor is your friend in the Auxiliary, and a bridge to the United States Coast Guard. What Literature is Available? We distribute – always at no charge – the latest Federal and State boating safety brochures, booklets, and handouts. And we provide you with a distinctive literature easel to hold it. Meet the Commandant’s weight standards. Meet the Commandant’s grooming and uniform appearance standards. Have completed recruiter training or the recruiter PQS. Be actively working for a Coast Guard recruiting office and receive a positive recommendation from the Recruiter-in-Charge (RIC). The RIC of the recruiting office must forward a request to the Mission Execution Branch Chief via the RIC’s enlisted recruiting supervisor. Auxiliarists are authorized assignment to duty to assist the U.S. Coast Guard Academy (USCGA) with recruitment of cadet candidates as part of the Academy Admissions Partner Program (AAPP). Such assignment includes orientation and counseling of high school students, attendance at college fairs, and participation in the Academy Introduction Mission (AIM) each summer at USCGA. Participation in the AAPP is subject to successful completion of required program requirements as defined and recognized by the Coast Guard Academy Director of Admissions, and as established in Coast Guard Academy Admission Partner Program, Superintendent Instruction 1131.5. For the purpose of Auxiliary support, program participation also includes on-site participation as an AIM candidate, and the provision of associated on-site administrative, logistical, and health services. 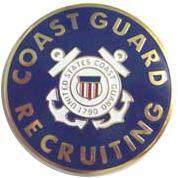 All Auxiliary members represent the US Coast Guard Auxiliary and therefore are acting as recruiters. Those Auxiliarists who take a more active role in recruiting are eligible for recognition awards. Members who wish to participate in authorized Auxiliary surface operations must first have passed or successfully challenged the core portion of the Boating Skills and Seamanship or Fundamentals of Sailing Course, Boating Safely Course or the US Power Squadron’s Public Education courses and then must qualify under the boat crew program. The crew member assists the coxswain with handling the boat and performing mission activities. Skills include line handling, knot tying, communications, observation, making up tows, and emergency procedures. Qualification at this level requires only minimum knowledge and experience. Attaining this qualification allows the member to serve as a crewmember on an Auxiliary boat facility while operating under Coast Guard orders. The coxswain is in charge of the facility and is responsible for directing the safe navigation of the boat, the activities of the crew, and the performance of the missions. Skills of a qualified coxswain include navigation, piloting, boat handling, communication, search planning, and emergency procedures. Qualification as a Coxswain allows the member to serve as the operator of an Auxiliary boat facility while operating under Coast Guard orders. Operates personal watercraft (PWC) on Auxiliary patrol orders. Like the coxswain, the PWC Operator is in charge of the facility, and is responsible for the safe operation and navigation of the PWC as well as carrying out the assigned mission. An Auxiliarist may earn and wear either of these insignia (pictured above) if they complete the required training and maintain the service requirements. The Boat Force Operations insignia is a solid matte silver toned metal device with an eight point compass/compass rose, over a crossed boat hook and oar centered over stylized waves. The insignia is unique in one design which comes in two color schemes: a pewter-toned device indicating five years of service at boat force units and qualification as a boat crew member, and a silver and gold-toned device indicating five years of service and completion of a series of Coast Guard Force leadership related requirements. 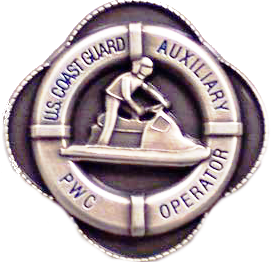 The Auxiliary Cutterman insignia (pictured above) is intended to identify and recognize the commitment of Coast Guard Auxiliarists currently working in the cutter fleet who have regularly dedicated their efforts in support of the cutter community. This insignia distinguishes those Auxiliarists who have achieved the requisite level of qualification, knowledge, and experience that includes both practical and proven understanding and appreciation for cutter force command, management, and operations. As an instructor in the Coast Guard Auxiliary, you will have an influence on many other people. What is less apparent is the degree to which you will influence your students. It is possible to influence attitude and self-efficacy, and it is possible to cause people with mediocre skills to excel. The importance of how we behave toward others cannot be overestimated. A facilitator or Instructor trainer applies training techniques such as principals of learning, motivation, communication, and instructional methods, among others. Grasping and practicing with these techniques will help the beginning instructor in their new responsibilities. Member Training includes all training provided in and by the Coast Guard and Coast Guard Auxiliary for Auxiliary members. It spans the following directorates: Response, Prevention, Vessel Examination, Public Education, RBS Outreach, Public Affairs, and Training. It includes AUXOP courses, Certification Courses, Public Education Courses, Mandatory Workshops, and Mandated Training. Training sources include Manuals, Power Points, Personal Qualification Guides (PQS), Exams or password protected on-line websites. It is often not clear where to look to find the training material you need or even to know what training is available and what pre-requisites are needed. Members of the Auxiliary can become a fully qualified Auxiliary Telecommunications Operator. Members that hold the qualification of TCO can operate Auxiliary Radio Nets that help to augment Coast Guard operations and Search and Rescues (SAR). Another job that a TCO qualified member can preform is station watchstanding. A station watchstander once qualified, operates the units radio, maintains radio & weather logs, maintains base security, answers phones and in certain circumstances will operate a SAR case and communicate with Sector Command.